Those are the beautiful mountains that our little wine-loving town of Stellenbosch backs onto. Wouldn't you love to live in these surroundings? We really do seem to have the best of both worlds here in Cape Town: We're almost surrounded by the ocean (as peninsulas tend to be), we have a great big mountain towering over our city, and we have big open winelands with beautiful blue mountain ranges. This truely is a remarkable part of Africa! 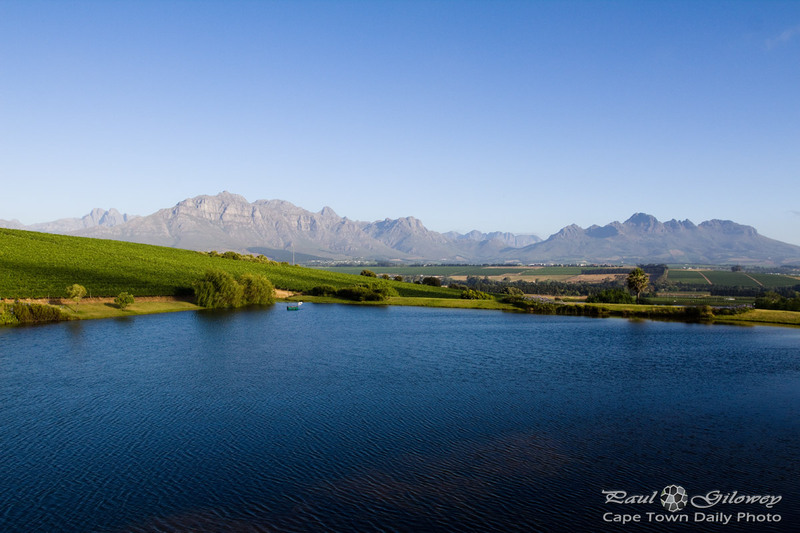 This photo was taken from the delightful Asara wine estate. The location on Google Maps has been wrong for some time now - here's a map I created to show you the way. Posted in General and tagged asara, restaurants, views, wine estate on Monday, 27 January, 2014 by Paul.